Eugenio Hernandez, one of three former Tamaulipas Governors being investigated by Siedo, Mexico's federal organized crime task force, for links to organized crime. 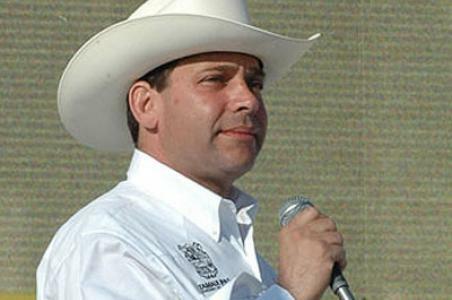 Read a profile of Governor Hernandez previously posted on Borderland Beat. MEXICO CITY (AP) — Mexican federal prosecutors said Tuesday they have launched an investigation of former officials from the violence-wracked northern border state of Tamaulipas, and three ex-governors say they are the among those being probed. Tamaulipas has been plagued by drug cartel violence and is the home base of two warring cartels, the Gulf and Zetas drug gangs. There have long been suspicions that state officials may have favored the once-dominant Gulf cartel, but that has never been proven. In a statement issued early Tuesday, the Attorney General's Office has not said why the former officials are being investigated, but by necessity it would involve federal crimes. Organized crime, drug trafficking and money laundering are all considered federal offenses in Mexico. The statement did not name the officials, but three former Tamaulipas governors confirmed that they had been targeted in the probe. Eugenio Hernandez, who left office in 2010, told local media he did not know why he was under investigation, and denied any links to organized crime. Tomas Yarrington, whose term ended in 2004, wrote in a Twitter account linked to his website that he had learned he had been named in the case, and said he hoped authorities would explain why. Manuel Cavazos, who left office in 1999, called the investigation "suspicious ... coming in an election campaign," and suggested it might have political overtones. He denied any wrongdoing. All the former governors are members of the Institutional Revolutionary Party, or PRI, which held Mexico'spresidency for 71 years until President Felipe Calderon's National Action Party won the 2000 presidential elections. The PRI's de-facto presidential candidate, Enrique Pena Nieto, currently leads in polls ahead of the July 1 elections. The mysterious probe came to light because prosecutors asked transportation authorities to keep track of when the ex-officials entered or left the country. Prosecutors never prevented the officials from leaving the country, and only asked local transportation authorities to advise the office when they did so. But the Attorney General's Office said one airport official in Tamaulipas overstepped his authority and actually issued a memo seeking to keep those named in the investigation from leaving the country. The Communications and Transportation Department said the official had been removed from his post. Cavazos said "it would not be the first time that law enforcement has been used for political purposes, that has been done since 2000." Cavazos is running for a seat in the Senate, and Pena Nieto was scheduled to visit Tamaulipas on Feb. 2, according to the PRI. Still fresh in most Mexicans' memories are the mass arrests carried out by federal prosecutors of 12 mayors and 23 other officials in the western state of Michoacan in 2009. All 35 were later acquitted and released. Michoacan is another state that allegedly served as a home base for drug cartels, and the officials were arrested on charges they had protected the Michoacan-based La Familia cartel. Politicians have long been under pressure from cartels in Tamaulipas. In 2010, gunmen believed linked to one of the cartels ambushed a convoy carrying the leading PRI gubernatorial candidate, Rodolfo Torre, killing him and four of his companions. Torre's brother then ran for and won the governorship. Three Mexican Army suffered more casualties Monday evening in a shootout with gunmen in the Pacific coast state of Sinaloa. Sinaloa newspapers reported that three soldiers were killed and two others critically injured in the incident that occurred in the northern Sinaloan city of Guasave that is known as a stronghold of the Beltran Leyva gang known as La Limpia Mazatleca. The Beltran Leyva gang in northern Sinaloa, led by "el Chapo Isidro"Isidro Meza Flores, has been waging a violent campaign against the state police and federal forces who they accuse of collusion with their bitter enemy Chapo Guzman and the Sinaloa Cartel. Los Mazatlecos are also active in the southern Sinaloa port of Mazatlan and the neighboring state of Nayarit. According to published reports an Army patrol was in pursuit of several vehicles with armed men on board through the streets of Guasave. At least two Army trucks were able to stop the gunmen in downtown Guasave but were outgunned and overwhelmed. Witnesses reported that the gunmen also suffered casualties but they were retrieved by fellow gangmembers, leaving behind only a white pickup and several weapons. No arrests were reported by the authorities. The gunbattle, which occurred at approximately 6:00PM Pacific time, provoked a state of panic as the area was filled with residents trying to escape the heavy volume of gunfire. Hundreds of empty cartridges littered the scene and nearby businesses were damaged. There were no reports of injuries or fatalities of innocent bystanders. The 40 minute standoff between the Army and state police against the municipal police officers ended with the 32 municipal officers at the scene being disarmed, handcuffed and detained for questioning, including police chief Leocadio Cabrera Delgado. Although not officially under arrest the officers were transported Tuesday morning to the state capitol of Culiacan for questioning by state prosecutors. The remaining municipal police force in Guasave has reportedly been restricted from patroling the streets, and the Army is out in force searching for the killers. These are the latest casualties that Mexican military forces have suffered within the past week. 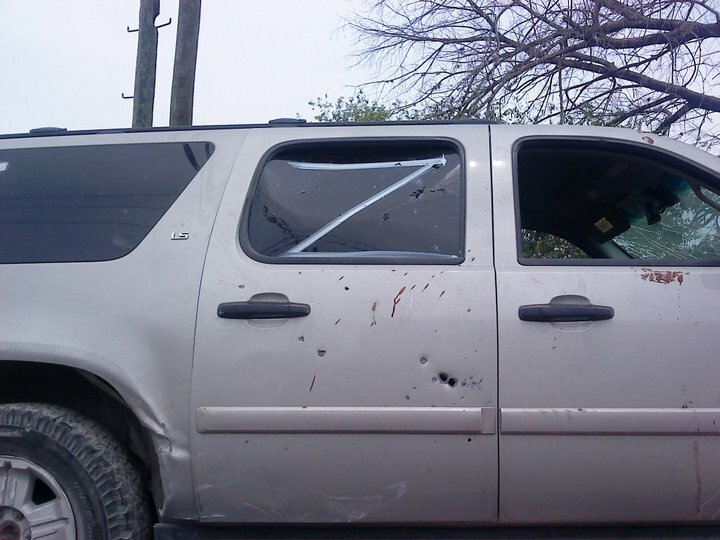 Last Friday a shootout in Nuevo Laredo left one soldier dead and five others wounded. Four gunmen belonging to Los Zetas were killed, although unofficially both the military and the criminals suffered higher losses. In what was a sudden upsurge in violence in Tamaulipas, gunfights broke out in several of the northern border state's cities last week through today. Although impossible to confirm, there are unofficial reports of military casualties, including deaths, in Reynosa, Matamoros and Ciudad Victoria. Violence has also been reported in Valle Hermoso, Rio Bravo and San Fernando. Image said to be that of a severely wounded military policeman in an emergency room in Matamoros, Tamaulipas after an attack outside of a police station by unidentified gunmen on January 22, 2012. On Tuesday, January 31, military forces kill at least three gunmen in separate gunbattles in Matamoros. A shootout in Jurez just south of the Zaragoza bridge left three suspects dead Monday morning, Jurez officials said. 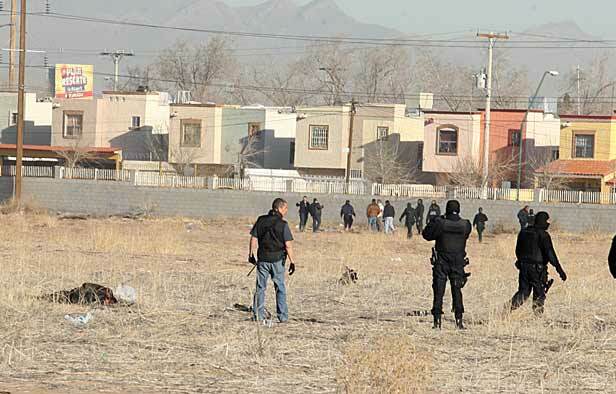 Juárez police Chief Julián Leyzaola said Monday that Johnny "El Tin Tan" Morales González, a member of the New Juárez Cartel, is responsible for recent attacks on the city's police force. Those attacks included Monday's shootout just south of the Zaragoza Bridge that left three suspects dead, three police officers wounded and three suspects under arrest. Juárez Mayor Héctor Murguía said the purpose of releasing Morales' identity was to encourage citizens to report any information about Morales' whereabouts to local authorities. Also, Murguia said city officials have managed to pinpoint nine criminal cells that might be behind the attacks against police officers. He did not elaborate. Jurez police arrested three people and seized weapons and other items in connection with an attack against police officers. During Monday's attack, the suspects opened fire and threw a grenade at police officers who were filling their cars at a gas station, officials said. The grenade did not detonate. "They (the suspects) showed up as kamikazes against our officers," Murguía said. "Our officers managed to spare their own lives." As a precautionary measure, Juárez police officers are now under orders to stay at several hotels, with around-the-clock surveillance. It will cost city taxpayers around $1.54 million to house and protect the officers. Murguía said some public projects would be canceled to cover expenses. "I have no choice," Murguía said. "Due to several attacks against Juárez police officers, where some of them have died, they have been sheltered in several motels." Police officers have been directed to wear plain clothes when their shifts end and carry their weapons home. Monday's shootout follows a fatal trend against police officers here that has left eight of them slain so far this year. "Juárez officers are still doing their jobs, at the expense of their own lives, to serve and protect the community," Murguía said. "Those (officers) who are afraid to die in the line of duty must quit the police force,² he said. "We don't need them." Murguía encouraged Juárez's citizens to report any crime in order to deter such activity. "It is crucial to point out that criminals might hide from the police," Murguía said. "But they (the criminals) can't flee from the citizens." Murguía took office in October 2010. Since then, 63 Juárez police officers have been slain, according to figures provided by officials and news archives. Shots fired during Monday's ambush could be heard at international bridge tollbooths. 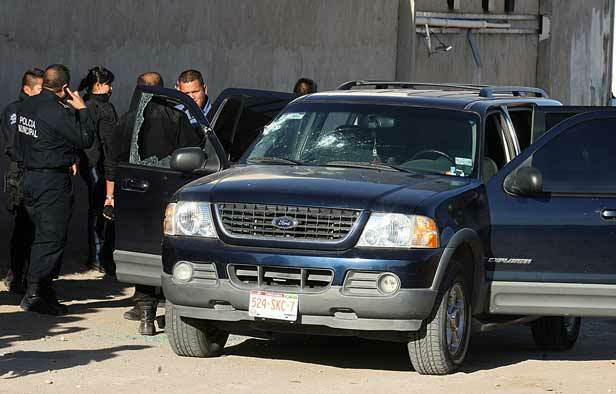 Gunmen attacked police at Gomez Morin and Clouthier streets in Juarez Monday morning. Three suspects were killed. Three suspects, all in their mid-20s, were found on the ground with fatal head wounds, according to the Chihuahua Attorney General's office. 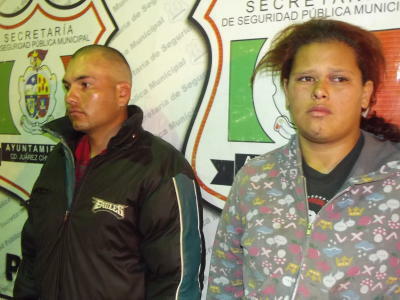 Late Monday, Juárez police arrested three additional suspects. They have been identified as José Samuel López Luévano, 19, the driver of one vehicle reportedly used in the shootout; Martín Pacheco Galindo, 22; and Silvia Adriana Loya Mendoza, 22, wife of one of the slain suspects. Among the items Juárez police seized included three U.S. passports, two of which had similar photos but different names, a police spokesperson said. Police also seized three visas, two Mexican identifications, several weapons and drugs, and narco banners. On Saturday, a Juárez police officer was slain. That happened after Leyzaola said last Friday recent threats against police officers have been coming from the New Juárez Cartel. 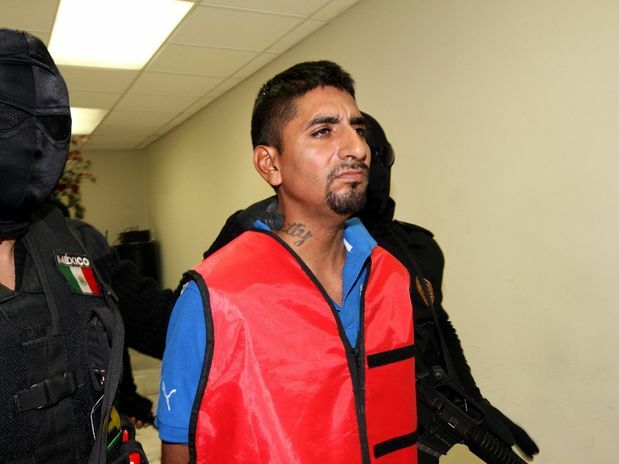 González, whom Leyzaola is pinpointing as the group¹s ring leader, is a former member of the Los Aztecas gang. Drug violence experts believe the New Juárez Cartel is a spinoff of the Juárez Cartel after that organization suffered heavy losses within its leadership in 2011. During the shootout, officers pursued the suspects, who fled the scene in a Ford Explorer vehicle, and killed them. Several streets were closed to traffic as officers chased the suspects. All three wounded officers were taken to local hospitals and are expected to recover. Police seized 250 bullet casings as well as two rifles, two handguns, and a fragmentation grenade with its trigger device activated, Chihuahua state prosecutors said. Jurez police arrested three people and seized weapons and other items in connection with an attack against police officers this morning. Authorities also took custody of a navy blue 2002 Ford Explorer that was reported as stolen last Tuesday, and a white Lumina found at a hotel parking lot, officials said. Murguía, in a speech delivered at a local school Monday, said Juarez's citizens should be proud of their police force. "The main thing here is to recover the peace that is so yearned for in this city," he said. Attacks against Juárez police officers come after finding about 10 banners last Wednesday, reportedly signed by New Juárez Cartel members, scattered across the city. Those messages, addressed to Leyzaola, threatened to kill one police officer per day and force Leyzaola to step down. Murguía dismissed those statements. "Leyzaola is not going to quit," Murguía said. "I would rather step down before Leyzaola does, and that is not going to happen since I am an elected official." 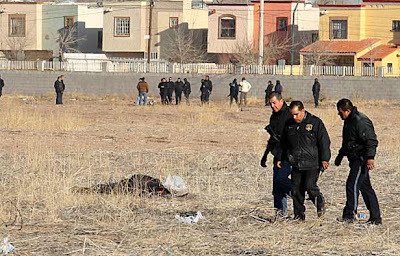 On Saturday morning, a Juárez police officer was shot to death near Cártamo and Garambullo streets in the Granjero neighborhood. 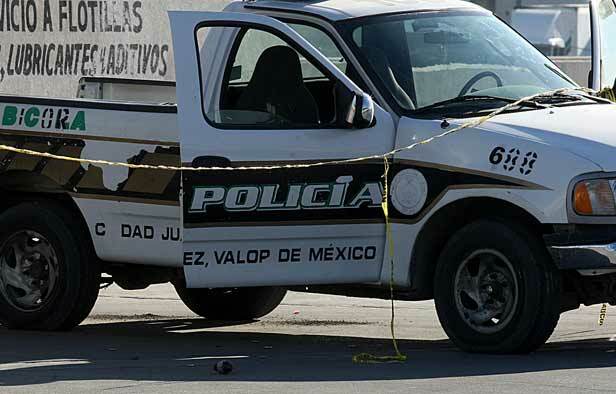 Julián Armando Juárez Baena, 35, was found riddled with bullets next to a red pickup. Forensics specialists recovered several casings from AK-47 and AR-15 rifles, state prosecutors said. 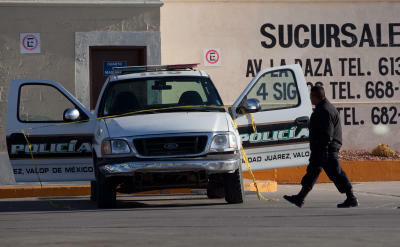 On Friday morning, two Juárez police officers, a man and a woman, were gunned down en route to work. Last Wednesday, two other officers were shot to death at the end of their shifts, while another officer was slain earlier that day. 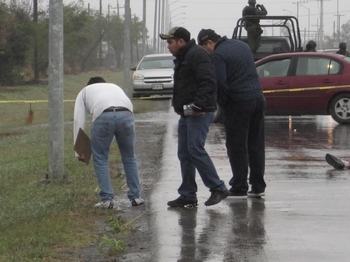 Eight people were killed and four others wounded in attacks staged by gunmen over the weekend in the northern Mexican states of Coahuila and Nuevo Leon, officials said. Gunmen opened fire with assault rifles on a group of people in Torreon, a city in Coahuila, killing five people and wounding four others, prosecutors said. “Two people died at the scene and first aid was provided to seven others who were wounded. Two of the wounded died later at University Hospital and another later at the Red Cross (Hospital),” the Coahuila Attorney General’s Office said. 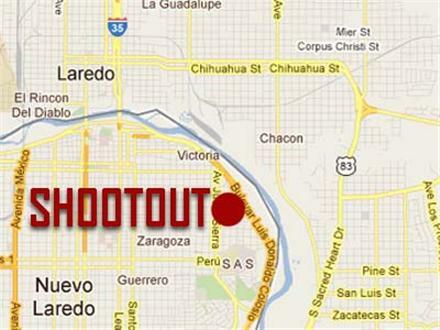 The shooting happened around midnight Saturday in Nueva Rosita, a district in the western section of Torreon. “Subjects aboard a white automobile opened fire with large-caliber weapons on several people,” the AG’s office said. A 15-year-old boy and a 20-year-old man were pronounced dead from gunshot wounds to the head at the scene, while Red Cross paramedics assisted six men and a woman. Investigators found 16 .223-caliber bullet casings from AR-15 assault rifles at the crime scene, the AG’s office said. The Sinaloa and Los Zetas drug cartels have been fighting for control of Torreon, resulting in a series of massacres over the past three years. Police in Nuevo Leon, meanwhile, found three bodies in a city outside Monterrey, the state capital and Mexico’s most important industrial city. The bodies of three men and a message to a drug cartel were found early Sunday in Cadereyta, located 37 kilometers (23 miles) east of Monterrey, the Nuevo Leon State Investigations Agency, or AEI, said. 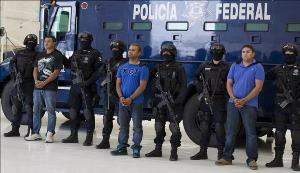 Seven Los Zetas drug cartel members were arrested by the Federal Police on kidnapping and other charges in Monterrey, the capital of the northern state of Nuevo Leon, the Mexican Public Safety Secretariat said. The suspects have been linked to at least six kidnapping, murder, sexual assault and auto theft cases in Monterrey, Mexico’s leading industrial city, the secretariat said. Two people being held captive by the suspects were rescued by the Federal Police, the secretariat said. The gang selected its victims at random, intercepted them while they were driving, threatened them with firearms and took them to safe houses, the secretariat said. Kevin Alejandro Sifuentes, 18, Leonardo Daniel Gonzalez, 18, Jesus Aleman Gonzalez, 21, Jose Ismael, Alfredo Salvador, Jovany Alejandro and a man identified only as Javier “N” were arrested at a safe house in Monterrey’s poor Solidaridad neighborhood that officers had been watching, the secretariat said. 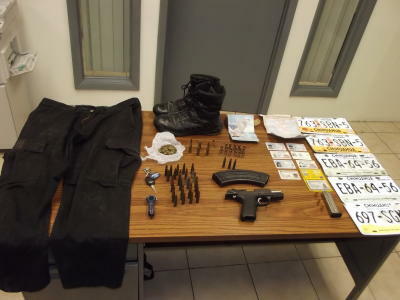 The Federal Police seized a Seat Ibiza with tags from Tamaulipas state, an AK-47 assault rifle, an ammunition clip, ammunition, 11 cell phones and two radios in the operation. The suspects and the property seized in the operation were turned over to federal prosecutors. Mexico has been plagued for years by a wave of violence unleashed by organized crime groups involved in kidnappings and drug, arms and people trafficking. An average of 49 kidnappings per day occurred in Mexico in 2011, marking a significant increase from the prior year, the Council for Law and Human Rights, or CLDH, said in a report released late last month. A total of 17,889 kidnappings occurred in Mexico last year, up 32 percent from the 13,505 abductions registered in 2010, the non-governmental organization said. The figures do not include “express kidnappings,” in which a victim is held for only a few hours, the CLDH said. Hundreds of express kidnappings occur in Mexico City daily, with taxi drivers usually assisting the criminals, the NGO said. About one-third of the kidnappers arrested by the Federal Police, according to official figures, have links to drug cartels. 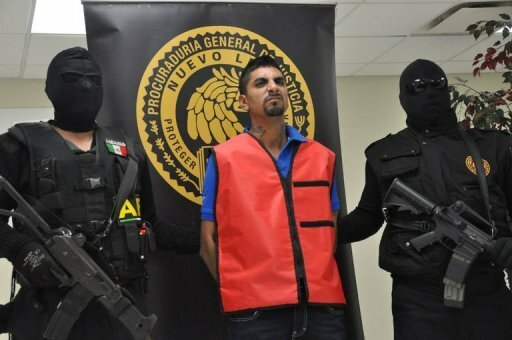 A suspected member of the Los Zetas drug cartel was arrested and confessed to 75 murders, officials in the northern Mexican state of Nuevo Leon said Monday. Enrique Aurelio Elizondo "El Arabe" confessed that he is a member of a Los Zetas cell that operated for the past three years in the cities of Cerralvo, Paras, Agualeguas and General Treviño,” state Security Council spokesman Jorge Domene said. Elizondo “participated in the kidnappings and murders of 50 passengers who were on a bus that came from Reynosa, Tamaulipas, while it was passing through the bus station in Cerralvo” in January 2011, Domene said. Elizondo’s Zetas cell kidnapped people from two other buses and murdered 44 passengers suspected of being gunmen from the rival Gulf cartel, the security official said. The suspect confessed that he shot several passengers with his AR-15 assault rifle and burned others, killing a total of 75 people. Investigators, however, suspect that Elizondo may have killed more than 100 people, Domene said. Los Zetas targeted intercity buses in an effort to recruit gunmen, extort money from migrants headed to the United States and murder suspected members of rival drug cartels. 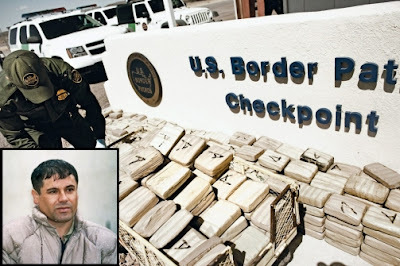 Heriberto Lazcano Lazcano, known as “El Lazca,” deserted from the Mexican army in 1999 and formed Los Zetas with three other soldiers, all members of an elite special operations unit, becoming the armed wing of the Gulf drug cartel. After several years as the armed wing of the Gulf cartel, Los Zetas, considered Mexico’s most violent criminal organization, went into the drug business on their own account and now control several lucrative territories. Elizondo also confessed to the murders of a woman and a girl in the city of Cerralvo, Domene said. Investigators used information provided by the suspect to arrest three other Zetas members and locate a property used to burn and bury bodies, the state security official said. About 2,000 people died in drug-related violence last year in Nuevo Leon, where more than 300 people are listed as missing. Los Zetas has been blamed for several massacres in recent years. The cartel was accused of being behind the Aug. 23, 2010, massacre of 72 migrants, the majority of them from Latin America, at a ranch outside San Fernando, a city in the northeastern state of Tamaulipas. 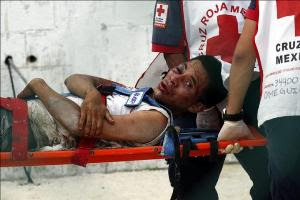 Los Zetas has also been blamed for the massacre of 27 peasants in May 2011 at a ranch in Guatemala’s Peten province, which borders Mexico and Belize. Zetas gunmen set fire to the Casino Royale in Monterrey, the capital of Nuevo Leon, on Aug. 25, killing 52 gamblers and employees trapped inside, most of whom died of smoke inhalation. There are usually just three ways for a trafficker to leave a Mexican drug cartel: go to prison, get killed, or become a government informant. Two weeks ago, I had dinner at an expensive restaurant near the Mexican border with a man who got out by the third route. 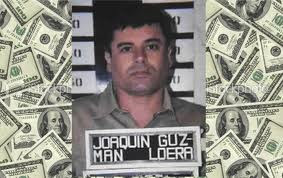 He was, until recently, an important figure in the Sinaloa cartel’s drug-running operations, working indirectly for the boss, Joaquín “El Chapo” Guzmán. Casually dressed, he used a small fork to scrape the marrow from the shank bone on his platter of osso buco. He joked that he wished he had a soft tortilla on which to spread the marrow, the old Mexican way, the way his family did it with a butchered animal. ﻿﻿The informant, who did not want to be named for fear of reprisals, rattled off prices for the drugs he used to transport. They are surprisingly cheap in large volumes: $6,000 per kilo of cocaine in Ciudad Juarez $1,000 more to deliver the drugs to an El Paso stash house just across the border. Tack on another $1,000 to truck it onward—to New York, Baltimore, Chicago, or Atlanta, where it sells wholesale for around $30,000. Most criminals who become informants do so because they’ve been arrested and squeezed, encouraged to betray their criminal employers in exchange for leniency. But this man had an unusual story to tell about his first encounter with U.S. federal agents. It was his boss, a top manager at the Sinaloa cartel, who encouraged him to help the Americans. Meet with the U.S. investigators, he was told. See how we can help them with information. At the time, Guzmán’s huge Sinaloa organization was in the middle of a savage war, trying to crush the Vicente Carrillo Fuentes cartel, known as the VCF. And the Sinaloa cartel wanted to pass along information about its enemies to American agents. So began another small chapter in one of the most secretive aspects of the drug war: an extensive operation by Chapo Guzmán’s forces to manipulate American law enforcement to their own benefit. Guzmán’s broad strategy has been to knock off rivals and build his own cartel into the dominant criminal force south of the border. 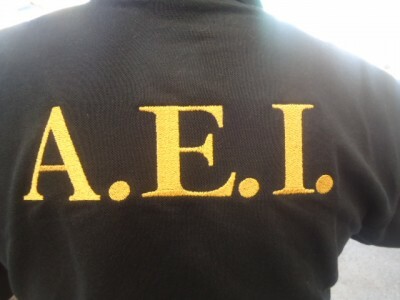 One of his tactics for achieving that has been to place his drug-dealing lieutenants as informants for the DEA and ICE. According to sources and court records, he has been carefully feeding intelligence to the Americans. Now, Newsweek has learned, there is a federal investigation into how ICE agents handled some Sinaloa informants near the border. Humberto Loya- Castro, a charming and erudite Mexican lawyer who served as Guzmán’s adviser, may have been his most intriguing agent. He became a key informant for the Drug Enforcement Administration during the last decade. A former DEA official describes Loya-Castro as “astute, witty. 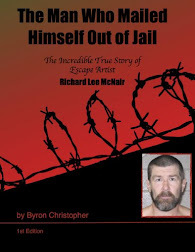 He was extremely charismatic.” His tips led to arrests, seizures, and headlines. Many of those law-enforcement victories, though, were also triumphs for the Sinaloa cartel. At the time of the indictment, Chapo Guzmán ran his Sinaloa operation from a Mexican prison. Being behind bars didn’t hamper the drug lord, who treated the jail as a private castle where prison guards scurried around like servants. Five years after the indictment, while Guzmán was still locked up, Loya-Castro first approached American officials, offering to feed them information. To appreciate his potential value, imagine if the leader of North Korea or Iran had a lawyer who offered to become an undercover U.S. operative. As a compadre of the Sinaloa boss, Loya-Castro had information that most investigators could only fantasize about. After Guzmán escaped from prison in 2001, Loya-Castro continued to feed U.S. agents information. In 2005 he made it formal, signing paperwork that made him an official confidential informant for the DEA. Because he was a fugitive from justice, facing an outstanding warrant, a special DEA committee had to sign off on the whole operation. 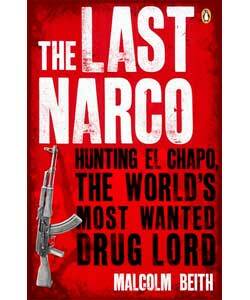 He was a productive spy, handing over what seemed like ever more vital information, mostly about the Sinaloa cartel’s enemies. The DEA agent assigned to handle him was a relatively new investigator named Manuel Castanon. He had spent five years working for the Border Patrol, then joined the DEA in 1999. He was assigned to a special task force based out of San Diego—a unit that wasn’t focused on the Sinaloa cartel. Rather, Castanon and his group were tasked with fighting one of Guzmán’s closest rivals, the Tijuana cartel, headed by the notoriously brutal Arellano Félix brothers.? The Tijuana cartel was small, but it was important because it controlled the vital smuggling routes through Baja California and San Diego. Both the DEA and Chapo Guzmán had an interest in its demise. The intended effect of such a tip was almost surely to focus the DEA on Guzmán’s rivals. It apparently worked: the Tijuana cartel has been mostly dismantled, and Chapo Guzmán has taken over lucrative territory. Loya-Castro’s material was so rich—so helpful in various cases—that in 2008 the U.S. attorney’s office in San Diego had the indictment against him thrown out. And the intelligence kept coming. In December 2009, in an operation trumpeted around the world, Mexican Marines encircled and killed Arturo Beltrán Leyva, a leading drug lord who had splintered away from the Sinaloa group. In Chapo’s hometown in Sinaloa, residents fired pistols in the air to celebrate, according to Malcolm Beith’s book on Guzmán, The Last Narco. It’s been reported that the Americans provided intelligence that led to Beltrán’s death. They even coordinated the signal intercepts that allowed the Mexican Marines to move in, according to a source who was involved. A source close to the cartel leadership says intelligence for the operation also came from Loya-Castro. In essence, it seems he had helped the Americans put a feather in their cap, while killing off one of his master’s worst enemies. 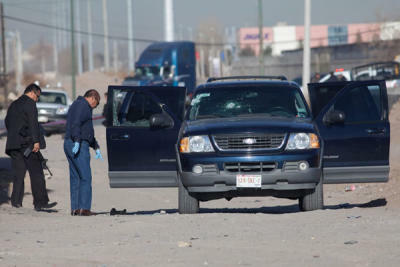 This morning a confrontation between Ciudad Juarez municipal police officers and sicarios was registered in the streets of Manuel Gómez Morin and Manuel J. Clouthier Avenue leaving a toll of three sicarios killed and one preventive police officer wounded. The incident took place shortly after 8:00 am as a group of gunmen onboard 6 trucks surprised the officers while they were refueling at a gas station and the officers managed to repel the attack. A version of the incident also suggested that at the same time of this attack, at another location, the police station at Benito Juárez also came under attack. This police station is located in the community of Zaragoza, east of the city of Ciudad Juarez. In this incident it is said that the police also managed to repel the attack, but it has not been confirmed by authorities. At the moment of the attack on the police station, the officers were in the middle of a shift change, with dozens of municipal police officers inside who were able to repel the failed assault. In the first attack a preventive police of patrol unit #651 was injured when he was struck by gunfire by some of the first shots fired by the sicarios. Once the sicarios realized they were outnumbered, they fled. An undetonated hand grenade was left not far from the police unit. One of the suspect's vehicles that was fleeing the scene was cornered on Avenida Manuel Gómez Morín and Manuel J. Clouhtier, forcing the occupants to descend and run into a vacant lot. The gunmen refused to surrender and began shooting a the police officers who returned fire killing the sicarios. The sicarios were wearing bulletproof vests, were armed with grenades, two handguns and an assault rifle AK-47 known as "cuerno de chivo," as well as a late model Chevrolet Silverado. The confrontation led to an intense mobilization of about 100 police units. The attack occurred around 8:00 am and lasted for about 15 minutes. This latest incident occurs at a time when preventive police are being forced to take shelter in motels after suffering numerous attacks by organized crime. At the end of the confrontation preventive police continued in their operation searching for more suspects, that resulted in the arrested of at least one man in the hotel Waterfill. So far the municipal Public Security Ministry has not issued an official statement. Sunday trial recap: Trial Exposes Zetas' US Ties. The Zetas criminal organization evolved and expanded between 2001 and 2008, going from hired guns to a sprawling drug syndicate with tentacles reaching into the U.S. — and trained hit men to protect the gang's interests here. The history and inner workings of the cartel were laid out by federal prosecutors over five days of testimony this month in a Laredo courtroom. Former cartel traffickers testified about the Zetas' smuggling operations, and hit men told jurors how they killed for its leaders — slaying their enemies with bullets in the U.S. and kidnapping rivals in Mexico and slaughtering them while bound. The testimony helped convict Gerardo Castillo Chavez, 25, who prosecutors say was an enforcer for the cartel in 2006 in Laredo. But it also provided a window into the Zetas and their transition from the enforcement arm of the Gulf Cartel to one of the largest drug trafficking organizations in Mexico. Gerardo Castillo Chavez in Laredo, Texas. Witnesses detailed six killings and eight attempted hits by the Zetas in 2005 and 2006. Today, the gang has split from the Gulf Cartel and is waging a bloody war against their former masters. But in 2001, when the prosecutors' story began, the Zetas were hired guns, a group of former Mexican army special forces who'd been dispatched to Nuevo Laredo to secure it for the Gulf Cartel. They also went to war against the west coast Sinaloa Cartel, which was trying to make its own inroads. One of the first Nuevo Laredo crime figures the Zetas brought on board was Miguel “El 40” Treviño Morales. Today, Treviño Morales is believed to be the Zetas' second in command. But when Dallas drug dealer Mario Alvarado met the Zeta while hunting white-tailed deer in the early 2000s near Nuevo Laredo, Treviño Morales was an up-and-coming trafficker, feared by his peers but not yet in charge. It wasn't long before Treviño Morales and Alvarado went into business, moving multi-kilogram loads of cocaine. When one of those loads got seized, he was responsible for the costs. Eventually, he owed Treviño Morales $500,000. The commander's brother, Omar “El 42” Treviño Morales, called Alvarado in late 2004 and told him to come to Nuevo Laredo. The Zetas handcuffed Alvarado and took his truck. They held him for about a month. When Alvarado's cohorts in the U.S. had paid off most of his debt, the Zetas let him go. By 2005, the Zetas had expanded to the U.S. They had stash houses in Laredo and were crossing drugs at the Rio Grande, testimony showed. They were also killing in the U.S.
Former Zetas hit man Wenceslao Tovar Jr., 26, testified in this month's trial that in 2005 he and his friend Gabriel Cardona, 25, went to work for the Zetas. After their first hit, Cardona and Tovar were taken to meet Treviño Morales. In the biggest revelation of the trial, Tovar testified he attended training camps where Zeta recruits were required to kill bound men with machetes and sledgehammers. One of those camps was near the northern Mexican city of San Fernando, where authorities last year uncovered mass graves containing 200 bodies. Tovar also testified that for a period in late 2005, he and Treviño Morales' bodyguard kidnapped dozens of people in Nuevo Laredo that they turned over to the Zeta commander for execution. Jurors heard that Treviño Morales dispatched at least four crews of hit men to Laredo. Some, like one headed by Cardona, were made up of U.S. citizens. Others were made up of Mexican citizens. A Mexican Mafia prison gang member who was sent to collect money from the Zetas in the border town of Miguel Alemán described his meeting there with Treviño Morales. Surrounded by his bodyguards, the Zetas commander was flipping through a binder full of pictures depicting the corpses of targets the gang had eliminated and the faces of people still on the list. A Drug Enforcement Administration agent testified that the gang was looking for about 40 people in the U.S. The Zetas' No. 1 target was a Laredo-area trafficker with ties to the Texas Syndicate prison gang named Jesus Maria “Chuy” Resendez. Resendez dodged an assassination attempt in 2004. In 2005, Treviño Morales' killers in the U.S. assassinated a former Nuevo Laredo cop under his employ. In 2006, Resendez's brother and one of his nephews were wounded in separate shootings. On April 2, 2006, the Zetas found their target. A pickup full of hit men from two crews pulled up alongside his truck and riddled Resendez and another nephew with bullets, firing nearly 100 times. Expanding north of the Rio Grande carried risks for the Zetas. Controlling trafficking routes in the U.S. was more profitable, but it made the gang more susceptible to infiltration by U.S. law enforcement agencies. Albuquerque firefighter, southern NM pecan growers caught up in federal drug trafficking busts. Federal authorities said Friday they’ve taken down two major drug trafficking and money laundering operations in different parts of New Mexico, one involving an Albuquerque firefighter and the other southern New Mexico pecan growers. Agents have seized caches of drugs, cars, cash, guns and even a tractor from a pecan growing operation near the New Mexico-Texas border. Federal officials said both busts will make communities safer and help with the effort to shut down distribution networks that funnel marijuana, cocaine and methamphetamines throughout New Mexico and from Mexico to other locations in the United States. In one case, 15 men living in the Albuquerque area were named in a 29-count federal indictment that was announced Friday by U.S. Attorney Kenneth Gonzales. “The charges in this indictment are some of the most significant drug and money laundering charges ever filed in the district of New Mexico,” Gonzales said. Ten search warrants were served Thursday and nine of the 15 defendants named in the indictment were arrested. They had their initial court appearances Friday. Prosecutors said those arrested included Steve Chavez, 32, a seven-year veteran of the Albuquerque Fire Department. The department said Friday it has not heard from Chavez, who was scheduled to report for duty Saturday morning. Officials said his future with the department would be decided soon. “Firefighters stand and fight for what is good and honorable in this world and if these allegations are true, firefighter Steve Chavez has betrayed his profession and his fellow firefighters,” Fire Chief James Breen said in a statement. Mexican nationals Jesus Ramos Castillo and Gabriel Guerra-Gonzalez were already in state custody, and authorities were searching for the four remaining defendants. The indictment alleges that the men conspired over the past nine months to distribute cocaine, methamphetamine and marijuana throughout central and northern New Mexico. Prosecutors contend that in a two-month period Chavez made cash deposits and withdrawals stemming from the alleged crimes that totaled more than $348,000. Defendant Ramon Gonzalez Jr. was accused of making transactions totaling more than $166,000. In the other case, authorities arrested nine people, including the owners of a southern New Mexico pecan farm, in connection with a trafficking and money laundering ring that involved cocaine and heroin. Prosecutors said the owners and operators of Pettit Farms and Nursery in Anthony, N.M., and their two sons were among those arrested Thursday. They were identified as Oscar Portillo Sr., his wife Sandra Portillo and sons Matthew Portillo and Oscar Portillo Jr. According to a 24-count indictment, the farm was used as a place to store and sell drugs. A team of federal, state and local law enforcement officers arrested the defendants Thursday and executed four search warrants, including one at the farm and three others at residences in El Paso, Texas. Federal prosecutors said the Portillos allegedly sold drugs to an undercover agent on five separate occasions. The indictment claims the couple asked the undercover agent to pay for the drugs with money orders which they subsequently cashed and deposited into bank accounts in the name of the farm. The agent was provided with invoices asserting that the agent had purchased pecan trees. A message left Friday for the Portillos at the farm’s store, the Nutcracker Suite, was not returned. Officials with the Drug Enforcement Administration said the investigation targeted a ring that agents believed was responsible for the transportation of cocaine and marijuana shipments from Chihuahua, Mexico, to the U.S.
“Organizations such as this one are essential to distribution networks of Mexican suppliers, and the arrests and seizures in this case will affect their ability to conduct business as usual,” said DEA Special Agent in Charge Joseph Arabit. At least four suspected gunmen and a soldier died in a shootout in Nuevo Laredo, a border city in the northeastern Mexican state of Tamaulipas, the Defense Secretariat said. An army patrol was attacked Friday on a street in Nuevo Laredo, located across the Rio Grande from Laredo, Texas, the secretariat said. Gunmen traveling in six vehicles opened fire on the soldiers, who returned fire. Five soldiers wounded in the shootout were taken to a hospital in the border city, the secretariat said. Soldiers seized five assault rifles, 50 ammunition clips, 525 rounds of ammunition and a vehicle. It all started around 3:50 p.m Friday in the Colonia Viveros, a neighborhood nestled along the banks of the Rio Grande River. Nuevo Laredo residents used the #NuevoLaredo hashtag of the social media network Twitter to report gunfire, detonations and a military helicopter in the sky. Residents reported that the helicopter was firing its guns into unknown targets below. The army is carrying out “Operation Northeast” in Tamaulipas, Nuevo Leon, Coahuila and San Luis Potosi states in an effort to weaken the drug cartels that operate in the region. 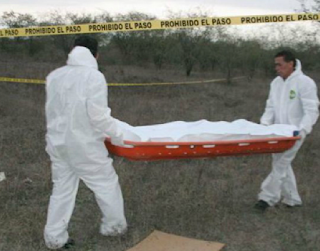 In 48 hours Jalisco racked up 30 homicides by various acts of violence, including the discovery in Ejutla of clandestine graves containing 7 bodies, of which four were burned beyond recognition. In Lagos de Moreno three policemen were shot; two sustained fatal wounds and were dead at the scene, the third was transferred to a medical facility for treatment. The gunmen followed the transfer and burst into the facility in a blaze of gunfire then bolted, triggering a police pursuit. While the pursuit was in force, other gunmen entered the facility and killed the injured policeman being treated from the original shooting. 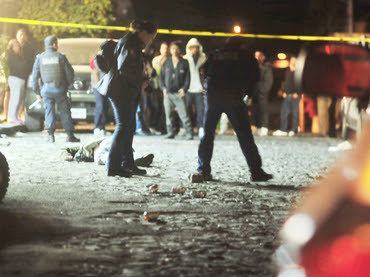 The homicides were in the metropolitan area of Guadalajara. -Close by to the three executed men were the bodies of Aldo Omar, 17 years old, Ernesto Guillermo Enrique Cervantes Castro Aranda and Jose Velazquez, 27. 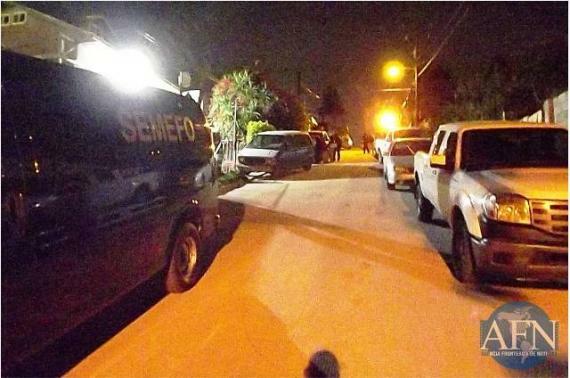 Last night, in Tijuana, in Colonia Tres De Octubres, at least three armed men dressed in black fatigues, with high caliber automatic weapons, burst into a house during an early evening party. In a sadly familiar scenario, the gunmen separated the men and women , leading the men into a room, and then opening fire, massacring all of them including one minor, a 13 year old boy. One of those killed, Daniel Cabera, is the brother of Omar Cabera, 'El R12', a former Tijuana municipal officer, who was detained Jan. 4, 2012, suspected of being the head of security of Alfredo Arteaga Azarte, 'El Aquilles'. About an hour after the attack, State Preventative Police, (PEP), working with municipal Tijuana police, as well as local Rosarito officers, caught up with the gunmen in Rosarito, who refused to stop their vehicle, which resulted in a gun battle between the PEP and the gunmen, who were eventually captured. Two Ak 47's, one R-15 assault rifles, and two pistols were recovered from the five men, whose identities and criminal affiliation are not known at this point. Different sources are conflicting on whether the gunmen captured in Rosarito Beach were those responsible for the murders in Tijuana, some say they were, others say it is still not known. Some reports say that this was a message to 'El R12', that he was warned if he cooperated with authorities his brother and family would be targeted. This kind of intimidation is common, when Federal police in Tijuana arrested Manuel Zambrano, 'El Jimmy', in August 2009, he was told through an attorney, that if he gave up information on members of the cartel, his family members would be murdered. This incident is the first of it's kind in 2012 in Tijuana, where, although murders are down nearly 50% from 2010, executions related to organized crime, and retail drug distribution continue with impunity. CIUDAD JUAREZ, Mexico – Four inmates were killed and seven others wounded in a fight involving members of rival gangs at the Aquiles Serdan prison in the northern Mexican state of Chihuahua, state officials said Sunday. Members of the Los Aztecas gang, which works for the Juarez drug cartel, fought with rivals from the Mexicles gang, the armed wing of the Sinaloa cartel, with homemade knives, Chihuahua state Attorney General’s Office spokesman Carlos Gonzalez said. “As of now, there are four dead and seven wounded, all of them prison inmates, and all attacked with knives,” Gonzalez said. Visiting hours were cancelled Sunday while investigators continue gathering evidence at the prison. Federal Police officers found 24 weapons, including five assault rifles and two UZI submachine guns, and 800 doses of marijuana, cocaine and heroin during a search last September of the Aquiles Serdan prison, which is in Chihuahua city, the state capital. Chihuahua, one of the states most affected by drug-related violence in Mexico, has accounted for about 30 percent of the more than 47,000 drug-related murders registered since President Felipe Calderon declared war on the country’s drug cartels in December 2006. Chihuahua is home to Ciudad Juarez, located across the Rio Grande from El Paso, Texas, and considered Mexico’s murder capital. The Juarez cartel has been battling the rival Sinaloa cartel for control of smuggling routes from Ciudad Juarez into the United States. The border city, which topped the list of the world’s deadliest cities for three consecutive years, dropped to second last year with 148 homicides for every 100,000 residents. The murder rate took off in the border city of 1.5 million people in 2007, when 310 people were killed, then it more than tripled to 1,607 in 2008, according to Chihuahua Attorney General’s Office figures, with the number of killings climbing to 2,754 in 2009. More than 3,100 people were murdered in the border city in 2010, making it the worst year since the cartel turf war sent the homicide rate skyrocketing in 2008. About 2,000 people were murdered in Juarez in 2011. A Zetas gang member who became an informant for the Drug Enforcement Administration testified Thursday how he helped authorities thwart attempted killings by the cartel, including a plan to use grenades to fight off police in Laredo, all the while keeping his snitching secret. Testifying under the false name of Rocky Juarez, the informant told how he provided his DEA handlers with real-time updates on the Zetas and the gang's operations. Later, when he was ordered to rent a safe house in Laredo for a Zetas sicario crew, the DEA was able to install cameras and microphones in the house to monitor their movements. It was dangerous work for the informant, who on more than one occasion was held at gunpoint during meetings across the border in Nuevo Laredo, Mexico, where the DEA couldn't protect him. Juarez took the stand Thursday in the ongoing trial of Gerardo Castillo Chavez, who's accused of taking part in killings and assaults in 2006 as part of a drug conspiracy. Jurors and federal District Judge Micaela Alvarez heard for the first time from a witness who placed Castillo Chavez at the scene of one of the crimes he's accused of. But it was the informant's testimony of the Zetas' inner workings and the extent to which the DEA has infiltrated the cartel that provided the day's most riveting testimony. Juarez, who worked first on the trafficking end of the Zetas' operations and later on the muscle end, had unprecedented access to Zetas leaders, testified J.J. Gomez, an investigator for the Webb County district attorney who's attached to a DEA task force. “Basically, all of the (federal) agencies were in need of him,” Gomez said. 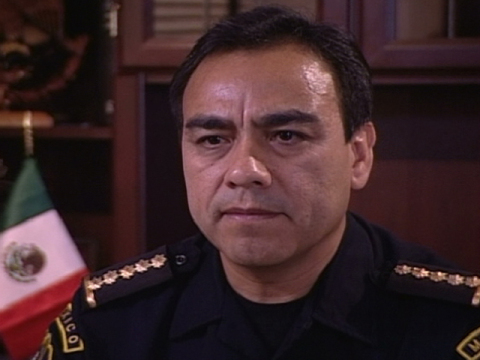 Juarez provided information that broke up attempted killings by the Zetas, and led to the arrests of the two hit men planning the Laredo grenade attack. He described an incident in 2003, before he began working for the DEA and was in charge of bribing Nuevo Laredo police officers for the Zetas, in which he was severely beaten. Miguel “El 40” Treviño Morales, now believed to be the Zetas' second-in-command, and his brother Omar “El 42” Treviño Morales thought the informant was working for another cartel and kidnapped him, he testified. He told jurors how the brothers put a plastic bag over his head and hit him in the stomach. Even after Miguel Treviño Morales said he was satisfied, his brother kept going, the informant testified. Enraged, the informant said, he got his hands on a baseball bat and hit Omar Treviño Morales. Dozens of Zetas stormed into the room and handcuffed him, the informant said. Omar Treviño Morales stood over the informant, pulling back the slide on his pistol to show the bullet that would kill him, he testified, when another Zeta boss named Ivan “El Taliban” Caballero Velasquez intervened. “Taliban came in and said, ‘Do me a favor and don't kill Rocky, because if you kill him, you're going to die on top of him,'” the informant said. It took the informant almost six months to recover from his injuries. After, he moved to the U.S., where he went to work on the drug transportation end of the Zetas' business. He became a paid source for the DEA in 2004, after his brother was arrested. In 2006, he was handed over to Gomez, one of two agents in charge of Operation Prophecy, an investigation targeting Miguel Treviño Morales. The informant fed agents information in early 2006 about an attempt to cross almost 1,000 pounds of pot on the Rio Grande and about a stash house where the Zetas kept cocaine. DEA officials would call in other agencies to make busts, Gomez said, to keep their fingerprints off the operation. “When we get information like that, we utilize a state or local agency to conduct the seizure, for (the traffickers) to not find out the DEA is involved,” he said. When the informant's supervisor, Ernesto “Nune” Carreon Vasquez was promoted to oversee the Zetas' sicarios, or hit men, the DEA was able to break up attempted killings, Gomez testified. However, the big prize came in April 2006 when the informant was ordered to rent the safe house, which the DEA filled with surveillance equipment. This week the community of Concha del Oro lived a day of terror, a feeling felt throughout the streets and businesses in the small town. It was all deserted, the schools were closed, all the businesses were closed, everyone hid inside the safety of their homes, Los Zetas had arrived. The reinforcement by the government was brought in and the battle grounds in the streets of Zacaetas were drawn. Los Zetas cartel has supplanted the Sinaloa mob as Mexico’s largest drug-trafficking organization in terms of geographic presence, security consulting firm Stratfor said in a report. At the close of 2011, Los Zetas operated in 17 states, or more than half the country, while its rival had operations in 16 states, Stratfor said, citing a report by organized-crime prosecutors. Unlike the Sinaloa cartel, which tends to use bribery to achieve its aims, the Zetas “prefer brutality ... intimidation and violence,” according to report published Tuesday. They also began to establish control over the Pacific coast state of Colima and its coveted port of Manzanillo. In contrast to the alliances Sinaloa forms with other cartels, Los Zetas’ ties with other gangs tend to be “more fleeting,” the report said. Despite losing 17 of its cell leaders and heads of plazas (drug-smuggling corridors) in 2011 to death or arrest, Los Zetas remained powerful and continued to be the dominant force in the Yucatan Peninsula, Stratfor said. The Sinaloa cartel, meanwhile, lost at least 10 plaza bosses or top lieutenants last year, although Stratfor said it is unclear how those setbacks affected the cartel’s operations overall. The Texas-based security consulting firm did note, however, that a government crackdown had affected the methamphetamine business of the Sinaloa mob, the dominant producer of that synthetic drug following the disintegration of the La Familia Michoacana crime syndicate in early 2011. According to the report, drug-related homicides declined last year in some areas – notably in Ciudad Juarez, Mexico’s murder capital – but rose in other places, including the cities of Veracruz, Monterrey, Matamoros and Durango. In 2012, Stratfor predicts “more signs of Mexican cartel involvement in the Caribbean, Europe and Australia” due to the growing difficulty of smuggling cocaine into the United States. The government said earlier this month that 12,903 people were killed in drug-related violence between January and September 2011 in Mexico, an increase of 11 percent from the same period in the prior year. The drug war death toll stood at 47,515 from December 2006, when President Felipe Calderon took office and militarized the struggle against the country’s heavily armed drug mobs, to Sept. 30, 2011. The murder total has grown every year since Calderon was inaugurated. 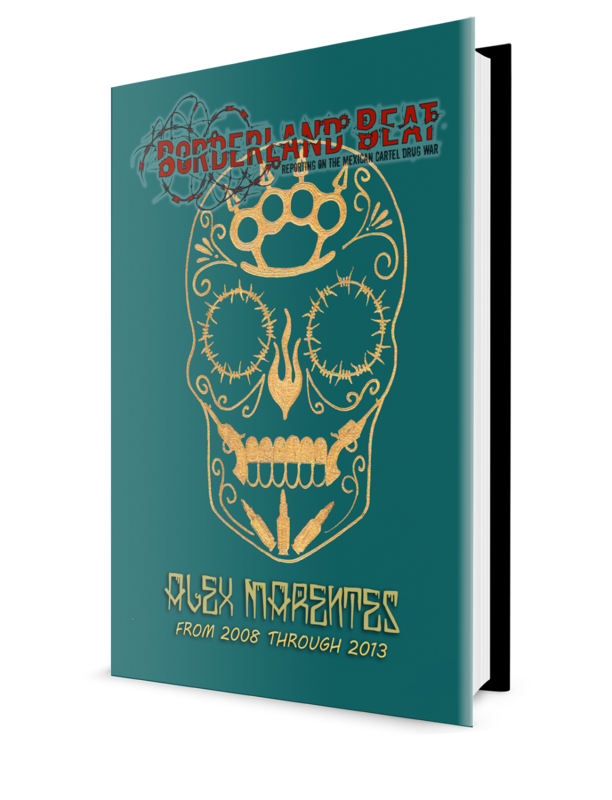 Unofficial tallies published in December by independent daily La Jornada put the death toll from Mexico’s drug war at more than 50,000. The mayor of Ciudad Juarez continues to support the work of the current boss of the Municipal Public Security Secretariat, Julián Leyzaloa, to the extent that he said he rather resign his position he holds as mayor, before the allows the resignation of the former Lieutenant Colonel. During his speech at the 18th Public Hearing held in the community of Tierra Nueva, he made it clear that there is very little chance of the resignation or forced resignation of Leyaola, as has been called by criminal organizations through banners left around the city. Not even in light of the eight officers that have been executed so far this month, will the Secretary of Public Safety leave his post, Hector Murguia said, "I will go first before Lieutenant Julian Leyzaola." However, he said that they have already discussed several strategies for police officers to be able to defend themselves from these attacks, such as allowing them to take their weapons home or housing them in hotels with security, as did the federal police during their stay in this border town. 11 are Killed in 20 Hours: So Where's the Media? 5 Policemen killed in Mexico City suburb. "Los Zetas the idol of children"
El “Guero Pelocho” arrested in Tepic Nayarit. Canadian citizen executed in Culiacan, Sinaloa. 47,500 Victims in Five Years? How safe is Mexico for tourists? Zetas respond to San Fernando banners.